Raaga.com: Doesn’t biopics like AZHAR glorify the baddies? Doesn’t biopics like AZHAR glorify the baddies? 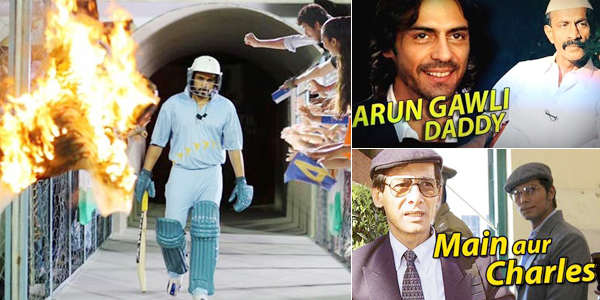 Biopics these days are the new success mantra in Bollywood thanks to the success of biopics like MAR KOM, BHAAG MILKHA BHAAG, PAAN SINGH TOMAR or Shah Rukh Khan’s hit film CHAK DE INDIA, which inspired from the life of hockey coach Mir Ranjan Negi, etc. On the positive side making movies on biographies of inspiring historical personalities is a good idea because these films not only entertain but also inject new vigor and motivate the younger generation to inculcate fighting spirit and achieve their goal. For instance Arjun Rampal’s forthcoming film DADDY, a biopic is on the notorious Mumbai gangster turned politician Arun Gawali. Incidentally Gawali, who fondly called Daddy by his fans, is currently serving life time imprisonment for the same. Another biopic which is in question is Randeep Hoda starrer MAIN AUR CHARLES, depicting the tale of renowned serial killer and drug dealer Charles Shobraj, who was famous as 'Bikini Killer’. And last but not the least even Ekta Kapoor’s forthcoming film AZHAR, being made on the life of controversial Indian former cricket captain Mohammad Azhardddin staring Emraan Hashmi. Though there is no second opinion that Azharuddin as a batsman and Indian Captain has been stupendous but the dark side of his career is that he has been found guilty of fixing matches with a bookmaker, Mukesh Gupta but the Central Bureau of Investigation, India’s federal probe agency and banned for life from playing cricket.